Technological innovation within the motorsport connector industry is driving cross fertilisation into the aerospace sector. Electronic Specifier Editor Joe Bush talks to Lemo (UK) MD Peter Dent to find out more. One of the key market sectors for Lemo connectors is the motorsport industry, and as the UK is a centre for innovation within this market and for Formula One, it is also a key focus for Lemo (UK). Not only that but Lemo’s owner also owns the Rebellion Le Mans racing team, so the passion for motorsport runs deep within the company. The number of sensors on the average Formula One car has increased dramatically over the last few years, as has the demands on the humble connector. These days they are required to be as small and as light as possible to aid weight distribution and improve performance. It’s here that Formula One has driven technology to a very high level and is constantly pushing for faster development of connectors, which enables Lemo to get ahead of the game when it takes these products to the aerospace sector (cross fertilisation), as they tend to be smaller, lighter and more flexible than those that are currently in use in this market. As Formula One has changed over the last few years they’ve introduced a lot of engine changes through legislation. This means that the requirements for better engine performance has increased, markedly. This has in turn resulted in more sensors on the car meaning there is a requirement for smaller sensor connectors. 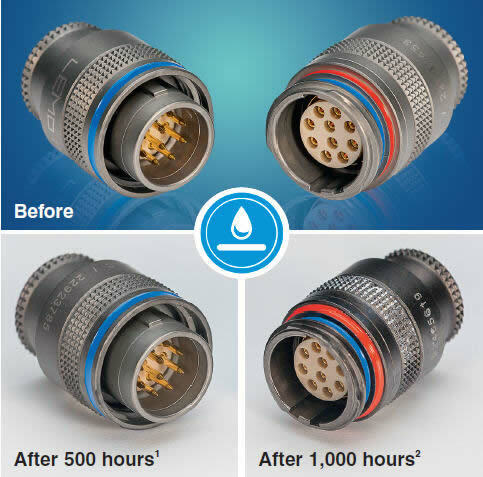 There’s been a whole new generation of connectors introduced to seek that competitive advantage. Cross fertilisation across some industries, particularly aerospace and defence, can take a considerable amount of time, however. Traditionally a more reserved industry, universal acceptance of a new product can take years, “I’ve seen connectors being used in the aerospace industry that were developed in the 1950s and 60s,” said Dent. The initial investment in getting platforms such as this up and running is huge and they run for many years. Once a product is entrenched into a military application it’s usually present for the lifetime of the platform unless there’s a major upgrade. The cost of qualifying a change is far more than the cost of the materials involved – it could cost hundreds of thousands of pounds to qualify a change of connector in a black-box for example. Because the applications are mission critical in the aerospace and defence sector, design changes are very tightly controlled. In contrast, at the end of every season in Formula One the teams get a new car, so the driving factor in that environment is the constant introduction of new design and an opportunity to push the boundaries every season - whereas in aerospace there aren’t as many technology insertion points as there are on a car.